It’s a truism that war robs us of our capacity for self-identification with others — or at least with those others whom we designate as "the enemy." The act of killing would obviously be impossible without this hardening of the heart, this psychological mechanism by which we teach ourselves to regard certain human beings as being, somehow, not quite human. Joshua Oppenheimer’s film, The Act of Killing takes as its starting point the pacifist view that war is caused by this assumed hardness of heart, rather than the other way around, and it sets out to illustrate that proposition in the case of a man, Anwar Congo, who admits to killing a thousand "communists" (the quotation marks are Mr Oppenheimer’s) in the aftermath of the Indonesian coup of September-October, 1965. Now a grandfather bearing a faint resemblance to Nelson Mandela, Mr Congo is encouraged by Mr Oppenheimer and the promise of becoming a kind of movie star like the heroes of his youth (Elvis and John Wayne get special mentions) to re-enact his part in the bloody deeds by which he became something of a hero to the Indonesian faction which has held power there ever since. But when he takes on the role of victim rather than killer he learns to regard his own long-ago actions with a measure of remorse. And what does this prove? If war takes away our compassion, ideology takes away our curiosity. Once we have got hold, as we imagine, of a system, an intellectual accounting for reality, all our own intellectual energies are henceforth diverted into defending that ideology, that version of reality, rather than investigating reality itself, which comes with no explanations or diagrams, no way of imparting meaning to it in advance. Joshua Oppenheimer is a man without curiosity in this sense. While a good documentarian takes us along with him on a voyage of discovery, he comes out the other end of his documentary knowing nothing that he didn’t already know going in. He celebrates himself — the movie begins with a director’s statement, delivered direct to the camera, telling us how to think about what is to follow — as well as his pacifist ideology by showing us what can be made to look like a kind of religious conversion, as an old man who was a killer nearly half a century ago is taught to adjust his view of the world to bring it more into line with that of the director. The whole thing is appallingly disingenuous — and in very much the same way that Voltaire was being disingenuous in the quotation the movie takes as its epigraph: "It is forbidden to kill, and therefore all murderers are punished — unless they kill in large numbers and to the sound of trumpets." The rationalist, that is, affects not to see or understand the obvious differences between war and mass murder and thereby issues a pardon in advance to those who, like Mr Congo, commit mass murder under the cover of waging war. Thus in his director’s statement, mentioned above, Mr Oppenheimer obligingly informs us that "There are no good guys and bad guys. They only exist in the movies and stories. Killing is done by people like you and me." Can he really be deaf and blind to the screaming irony of the fact that he says this as part of the process of making a movie and telling a story which — surprise! — has good guys and bad guys in it? You wouldn’t think so, but so it appears. The good guys are of course the victims, as good guys in the movies nearly always are nowadays. In this case they simply had the misfortune of having been labeled "communists" by their murderers — since, as Mr Oppenheimer frames his potted history of the events of 1965, there is no acknowledgment that there ever were any actual communists in Indonesia at the time, even though the PKI or Indonesian Communist Party was one of the largest in the world. These good guys or their descendants are themselves presumably but rather ostentatiously present in the movie as "Anonymous" — who is listed as a co-director and many of the crew. The bad guys are not only Mr Congo and Herman Koto, the two self-confessed killers to whom the movie devotes most of its attention, but also their accomplices in the government and the media who still occupy positions of power, and the Pancasila Youth who may be supposed to be self-condemned by wearing gaudy, fascist-style uniforms and cheering the government minister who is caught on camera delivering an anti-communist speech to them. The story is thus of a bad guy who becomes a sort of good guy by learning to see himself (or some much younger version of himself) as a bad guy, just as the director does. He also learns to take the director’s view that his own life and actions are to be understood exclusively in emotional and psychological terms and with scant regard for what either good guys or bad guys thought about what was happening at the time. The same emotional reasoning is therefore what is expected of the audience, and to review The Act of Killing as a movie is to some extent to be complicit in its attempts to make our flesh creep. However dreadful the killings were — and by all accounts they were very dreadful indeed — the point of re-enacting and recreating them on film here is solely to extract from the political and historical totality of what happened an emotional essence in order to produce that sense of being kicked in the stomach that movie goers now appear to seek out. 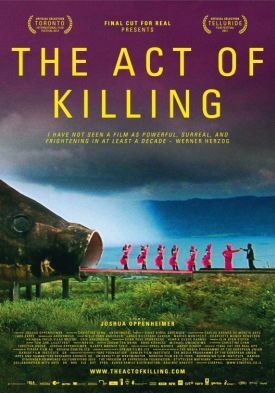 In fact, The Act of Killing can be seen as the documentary equivalent of a Quentin Tarantino movie, with the moral monstrosity of Messrs Congo and Koto standing in for the visible blood and guts which Mr Tarantino specializes in flinging in our faces. The visceral experience conveyed to the audience seems to me exactly comparable, and comparably meretricious. This is also why the moral and political background has to be simplified to the point of caricature, just as it is in a Tarantino movie, since we are meant to understand that these people did what they did, as Tarantinian villains characteristically do what they do, from the sheer enjoyment of killing. Mr Oppenheimer seems to have scoured the world in order to find some people who really do appear to have enjoyed their careers as killers and who, as they are protected by the still anti-communist Indonesian regime, are prepared to say so in front of his camera. And why? I think as demonstrations of the highly tendentious theory that all killing is killing for pleasure. In one sense, also as in a Tarantino movie, this makes killing look more "real," but in a larger sense it fundamentally falsifies what we would otherwise recognize as the reality: namely, that the Indonesian killings, like most killings, were not the mere consequence of blood lust. In order to produce its new moral sense in its main character, born of the first stirrings of empathy for his long-ago victims, the movie must pretend that there was no moral sense in operation at the time. Yet however misguided he was then and however penitent he is now, Anwar Congo still says that he had to do what he did. He doesn’t mean that he was compelled to it by some psychological malaise but that he regarded those he killed as his country’s enemies who would have killed him and others to whom he owed loyalty if he hadn’t killed them first. That judgment remains, apparently, unchanged by his emotional conversion. But, as the politics and history of the killings as they happened have been otherwise excluded from the film for the sake of its moral melodrama, few if any of those who have praised it in extravagant terms are likely to care.